As you grow more experienced with Exchange (2007 / 2010 / 2013 or 2016) you get to the point where you actually have to start using PowerShell more often. While most of the things can be done from Exchange Management Console or Exchange Control Panel in later versions doing stuff manually starts being boring so you want to automated things here and there. During our work with Exchange Management Shell at some point we've noticed that it takes a lot of time to actually load the modules. And by a lot of time we mean 5 minutes or more. It was very surprising as the server wasn't overloaded or didn't even had that many users. During starting up of the Exchange Management Shell you get an information that informs you some modules are getting loaded. Most of the admins will actually see this command loading window but it takes about 1-5 seconds to load at max. So we were quite surprised to see 5 minutes or even 11 minutes at one time. As you can imagine the frustration when you want to quickly do something and you have to wait for 10 minutes for EMS to start get on your nerves pretty quickly. We've researched many solutions to finally come to one that actually is as surprising as it can get. 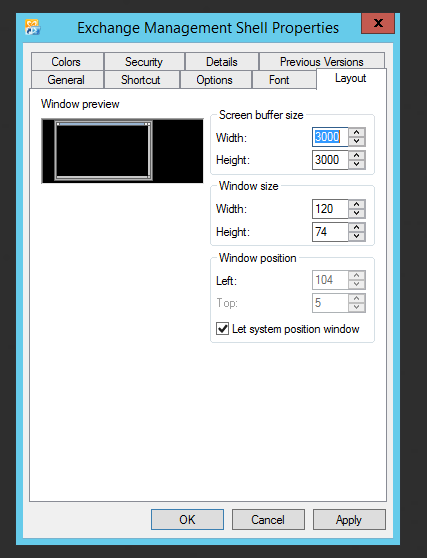 It seems the culprit of this is the setting of large buffer for the width of the Exchange Management Shell window! Our settings are extremely high to cover a large buffer and not loose any data in the output. As surprising it gets if you lower it to normal values (like 120) it start working as expected. Surprise, Surprise! It's still unclear why expanding the buffer to higher limits would cause such long delay on the loading of PowerShell EMS console, but fortunately we know how to workaround it for now.